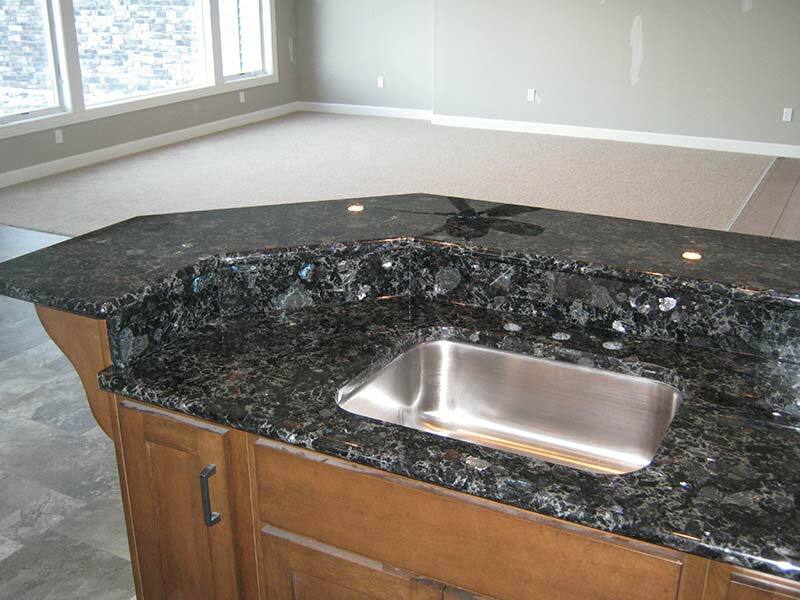 Black Cosmic Granite kitchen counter wrapping around corner. 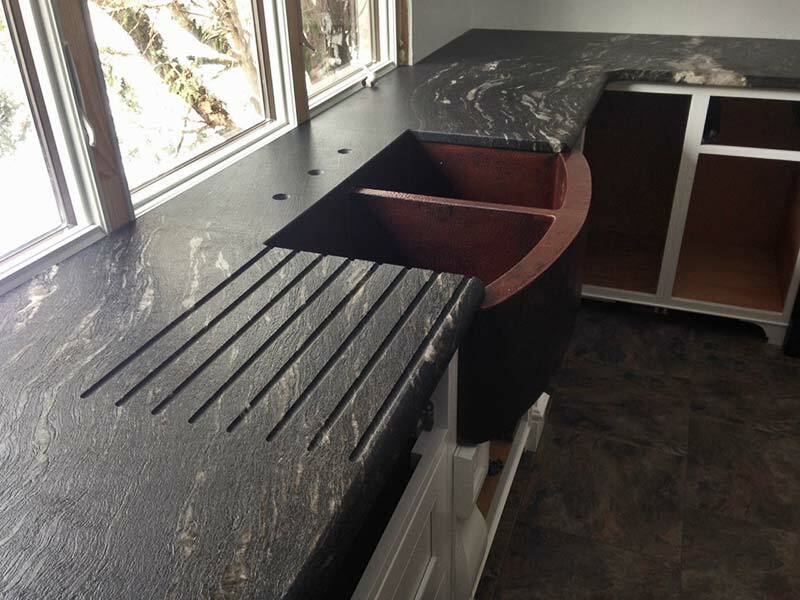 Leathered & Enhanced Black Cosmic Granite kitchen counter with custom drain board. 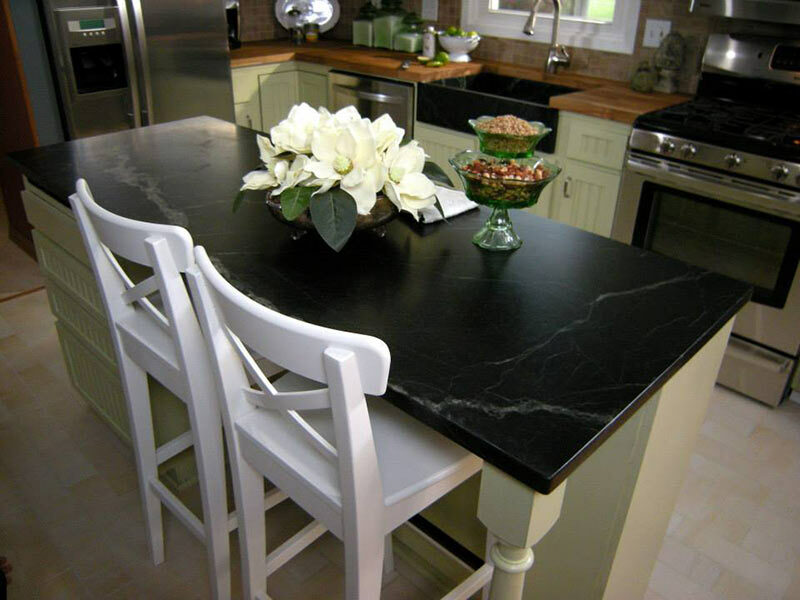 Black Marinace Granite kitchen island becomes the center piece of the room. 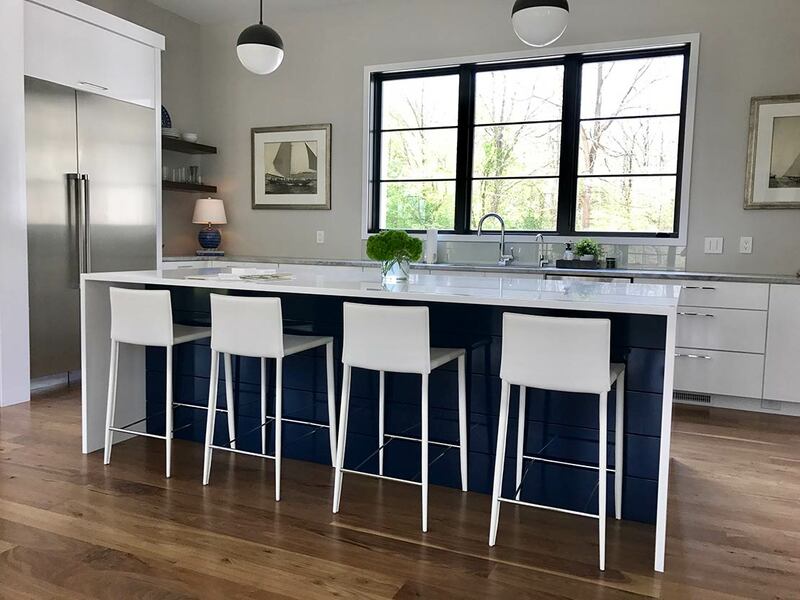 Blue Pearl Granite kitchen counter contrasts nicely against light colored cabinets. 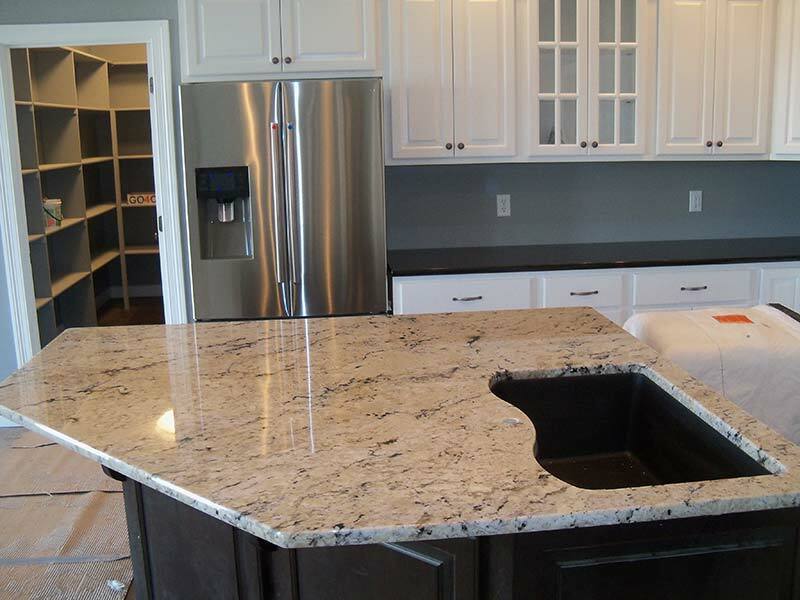 Caledonia Granite kitchen counter contrasting with light colored cabinets. 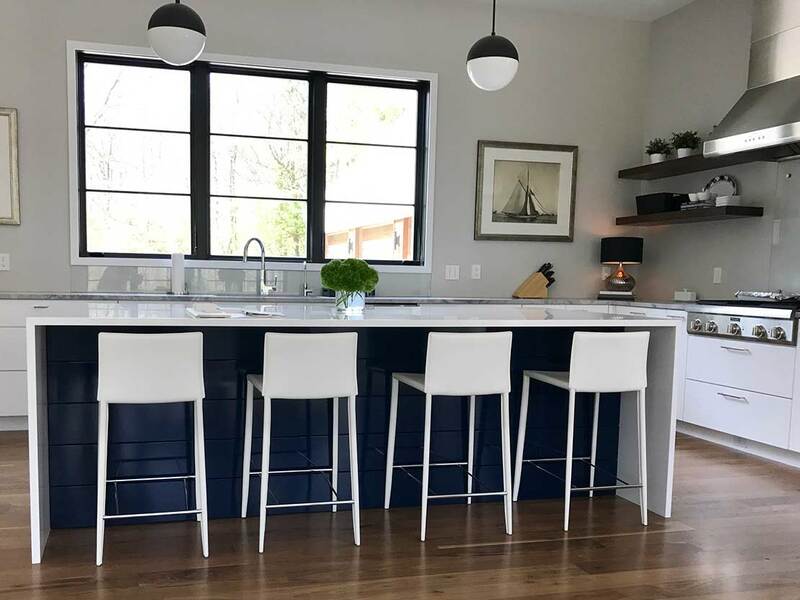 This Delicatus Kitchen island looks great over white cabinets with a light to medium green decor. 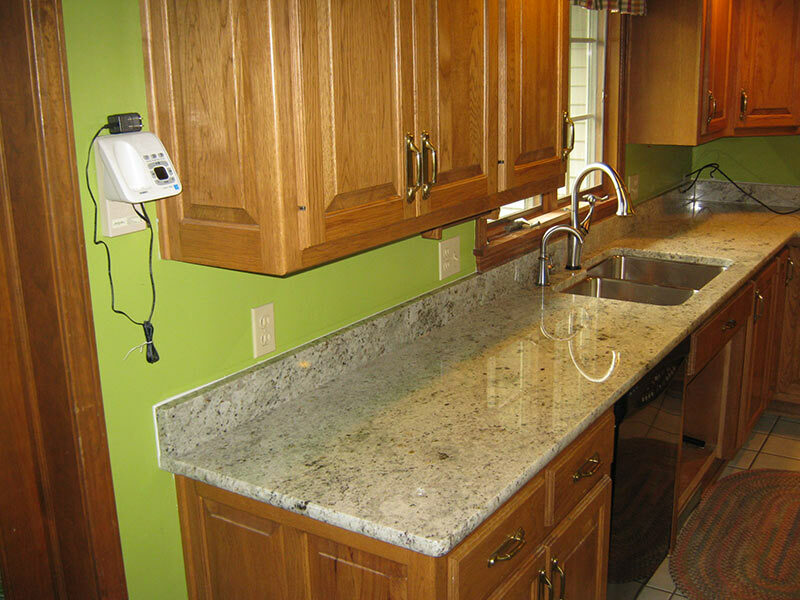 Polished Delicatus Granite on Expresso or Painted cabinets look great. 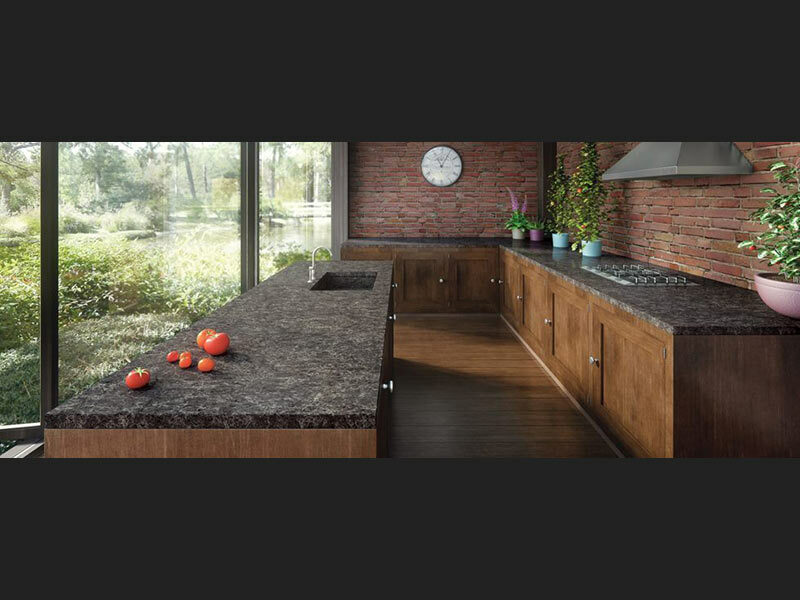 Delicatus Granite over dark wood is the spotlight of this kitchen. 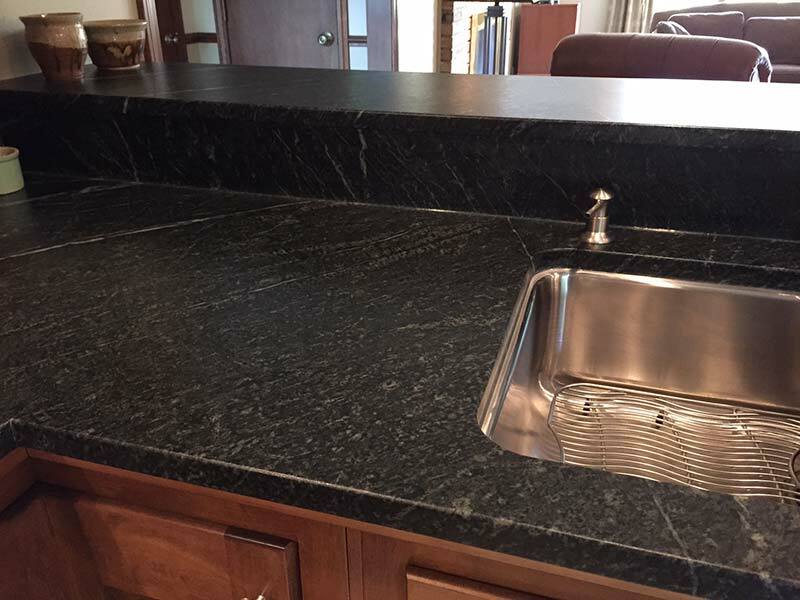 A close up of the cut out for the sink in this Delicatus Granite kitchen island counter. 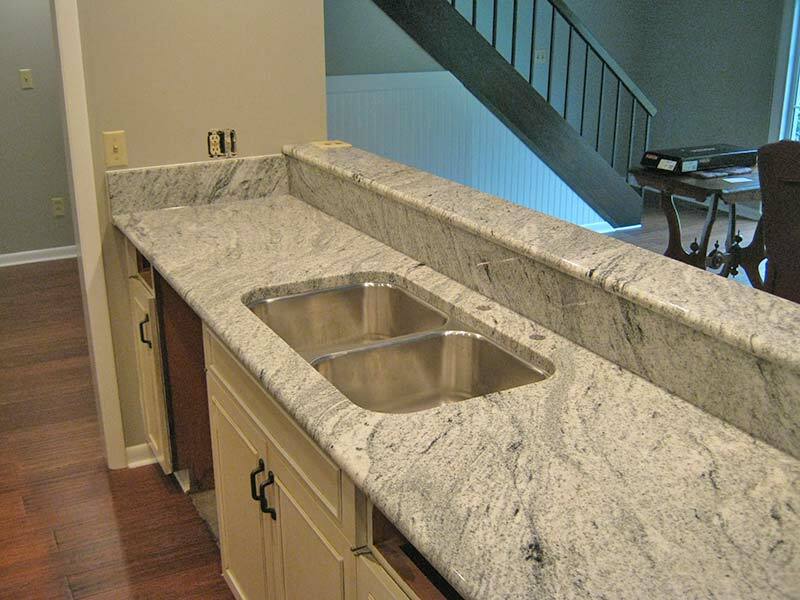 Delicatus Granite sink and kitchen counter. 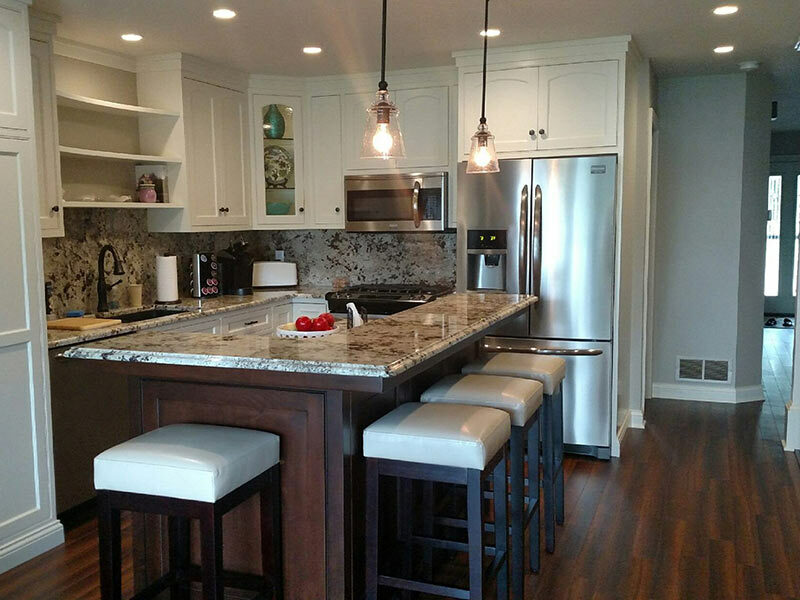 Medium toned wood cabinets warm up this kitchen with Delicatus Granite kitchen counters and island. 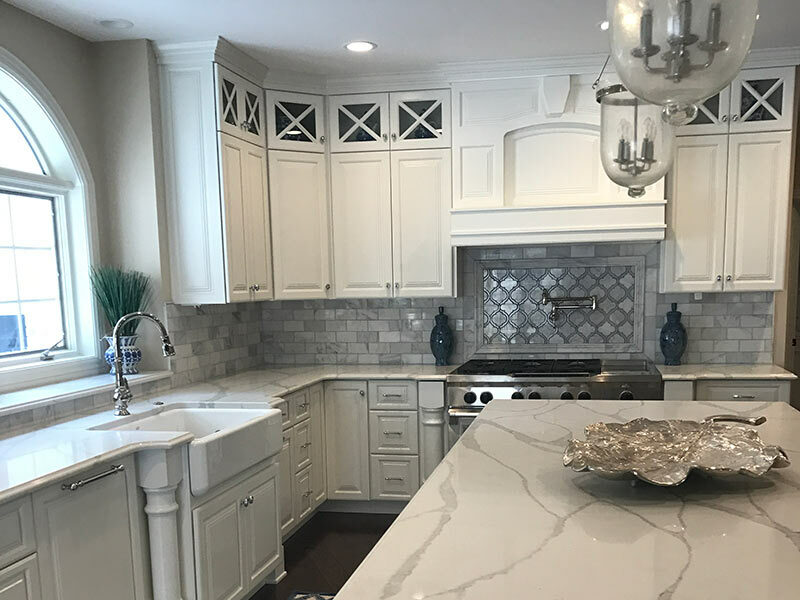 Diamond Wave Granite accentuates this counter top range surrounded by white cabinets and a neutral backsplash. 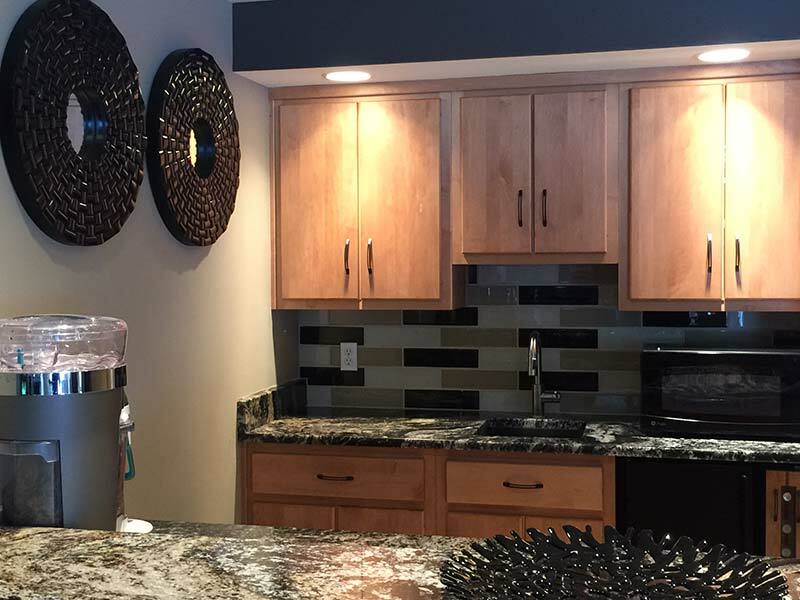 Diamond Wave Granite bar with dark wood cabinets. 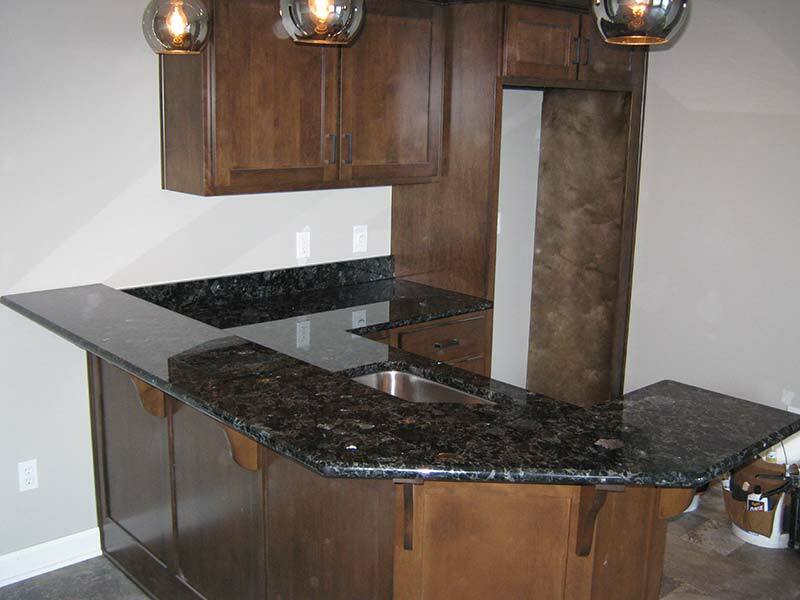 Diamond Wave Granite kitchen counter with medium wood toned cabinets and black accents. 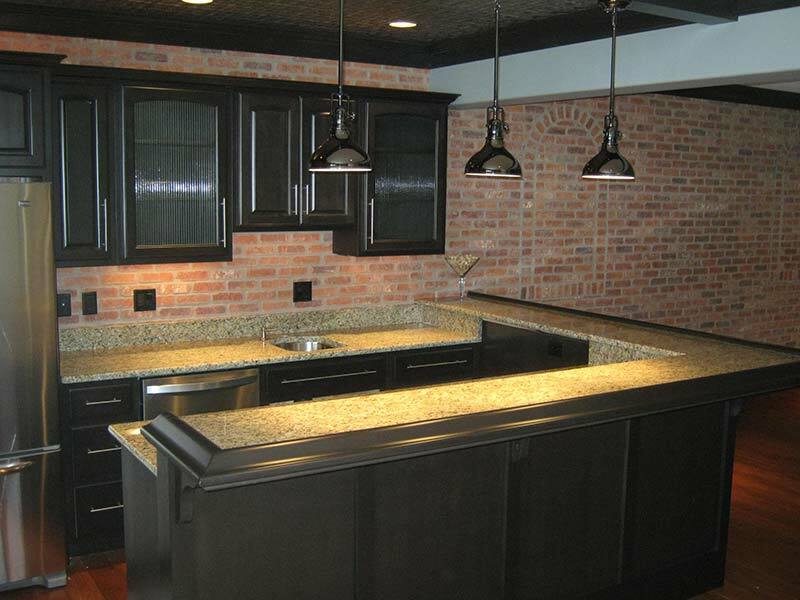 Emerald Pearl Granite kitchen counter surrounded by medium wood toned cabinets and brick. 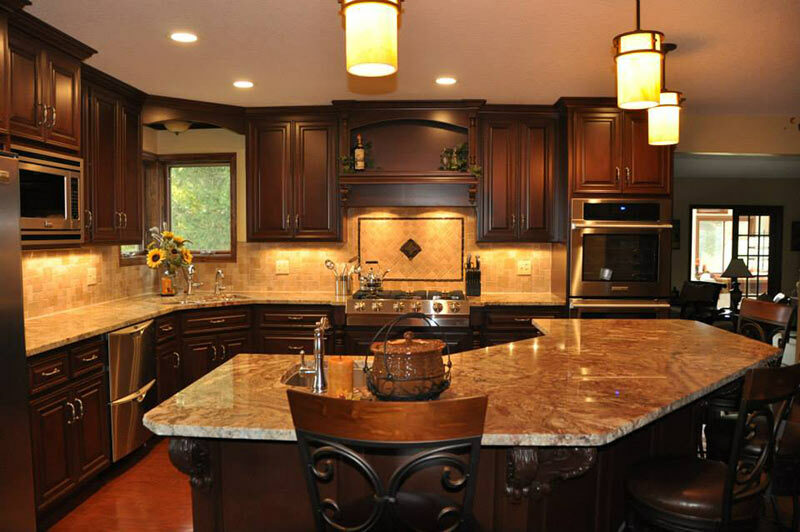 Giallo Ornamental Granite kitchen counters and center island show off this large kitchen with dark wood cabinets. 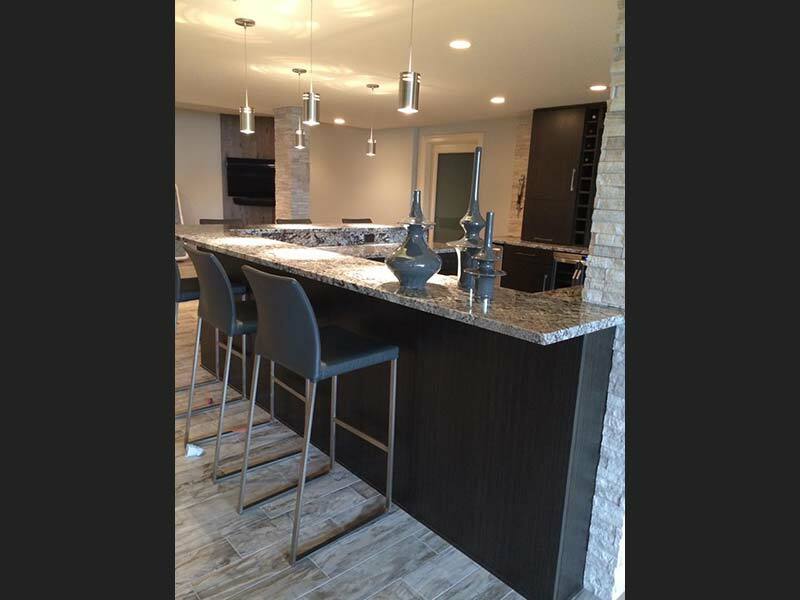 Giallo Ornamental Granite one level peninsula bar for seating. 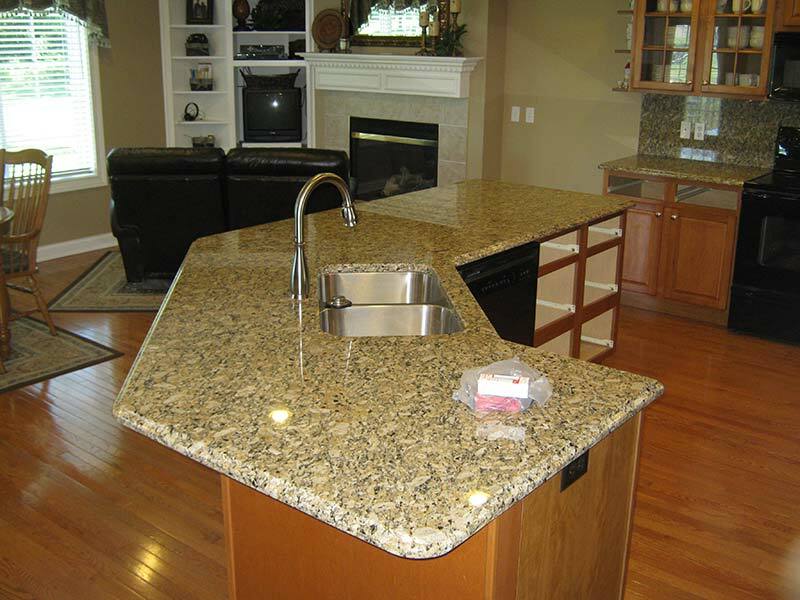 Giallo Ornamental Granite kitchen counter and island show off this warm toned kitchen. 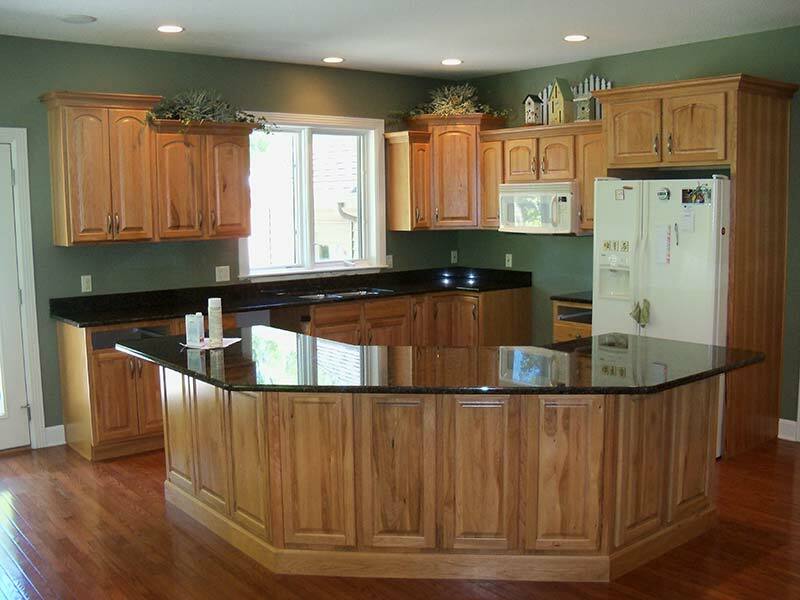 Giallo Ornamental Granite kitchen counters surrounded by medium dark wood cabinets. 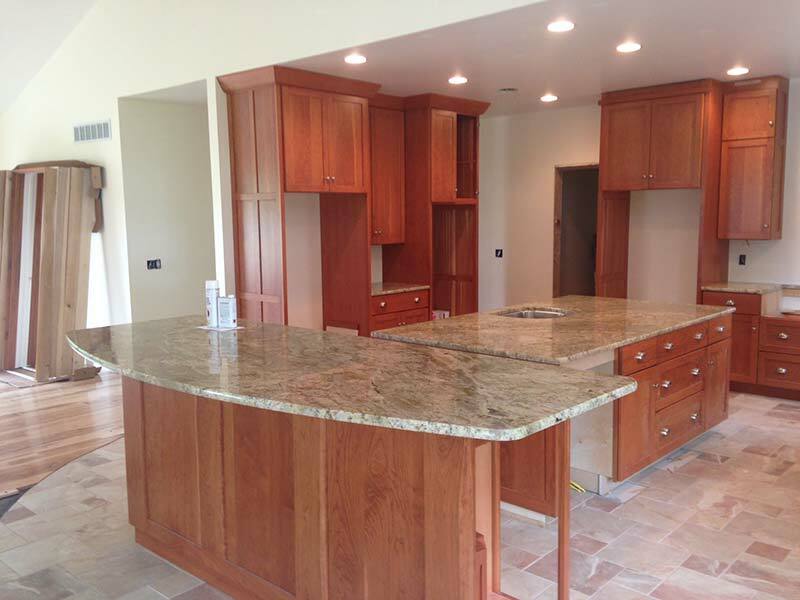 The Juperana Persa Granite kitchen counters and island just jump out against the warm toned wood cabinets. 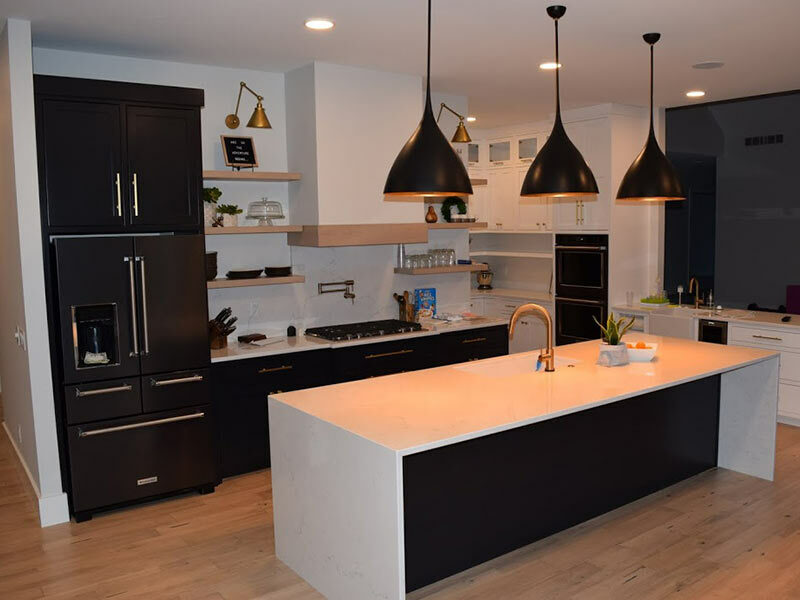 Juperana Persa kitchen counter bridging the gap between the kitchen and dining room. 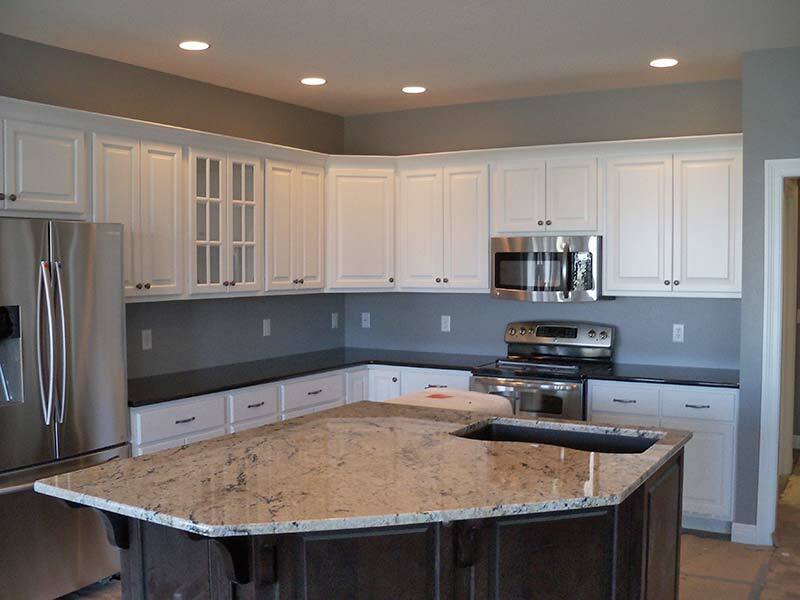 White Thunder Granite kitchen counter and dark brown cabinets, nice. 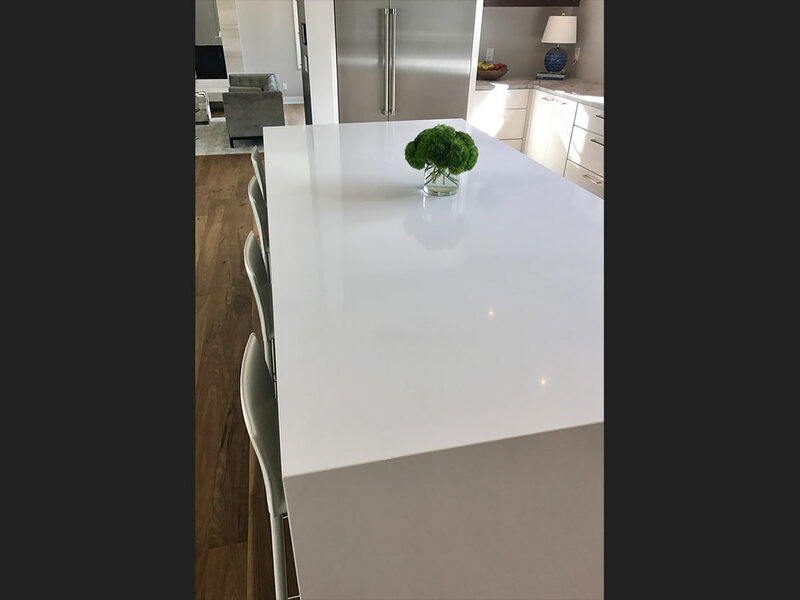 White Thunder Granite kitchen island and matching Lazy Susan. 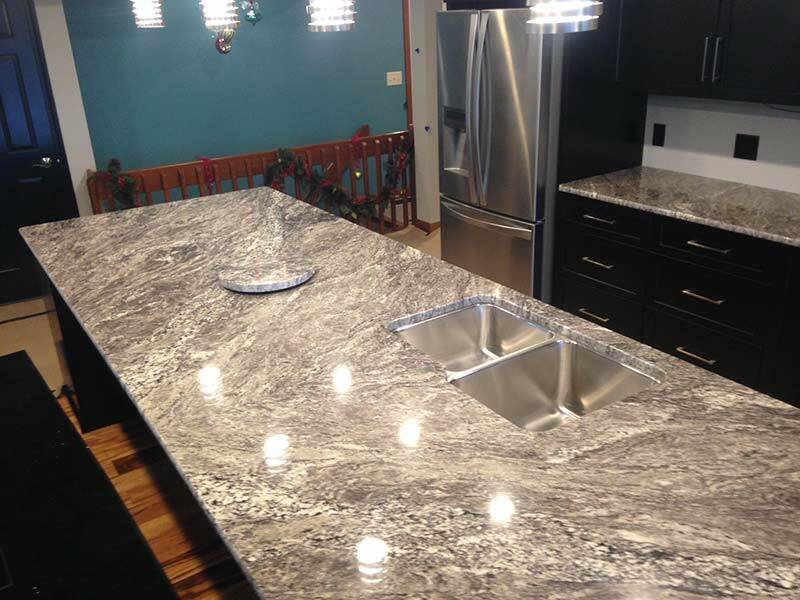 Volga Blue Granite counter sparkles against brown cabinets. 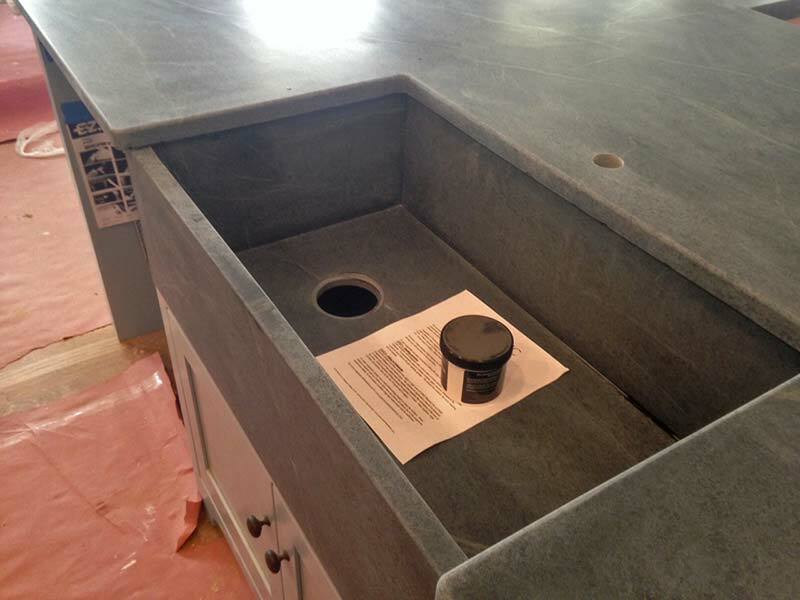 Volga Blue Granite kitchen island sporting a stainless steel sink. 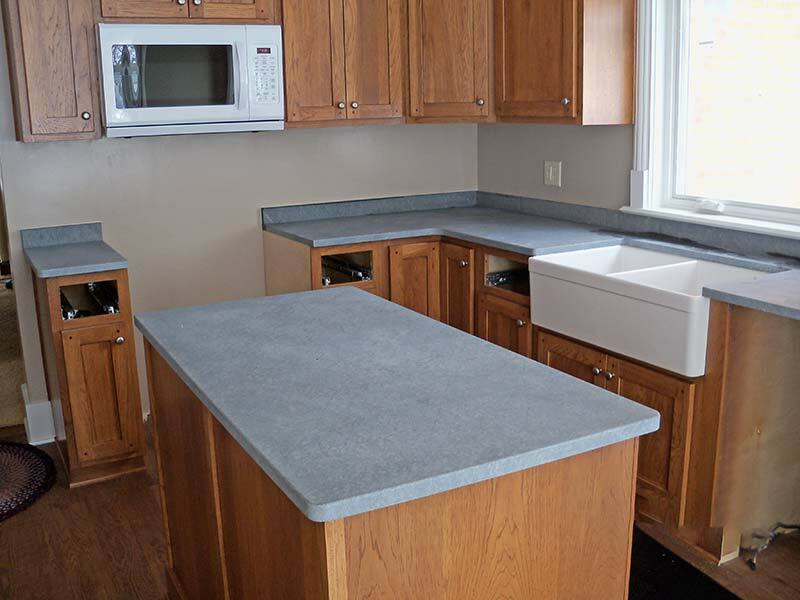 Volga Blue Granite kitchen counter with stainless steel double sink. 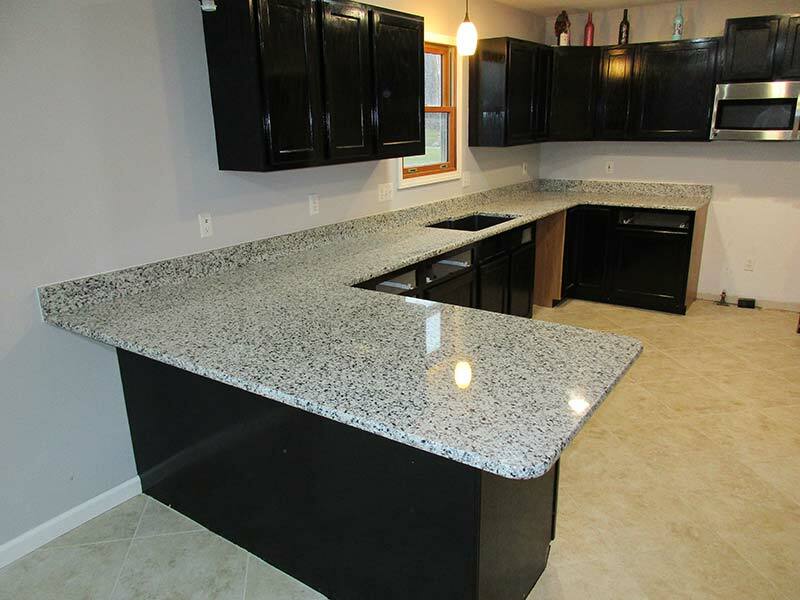 Viscont white Granite kitchen islands contrasting with dark granite counters. 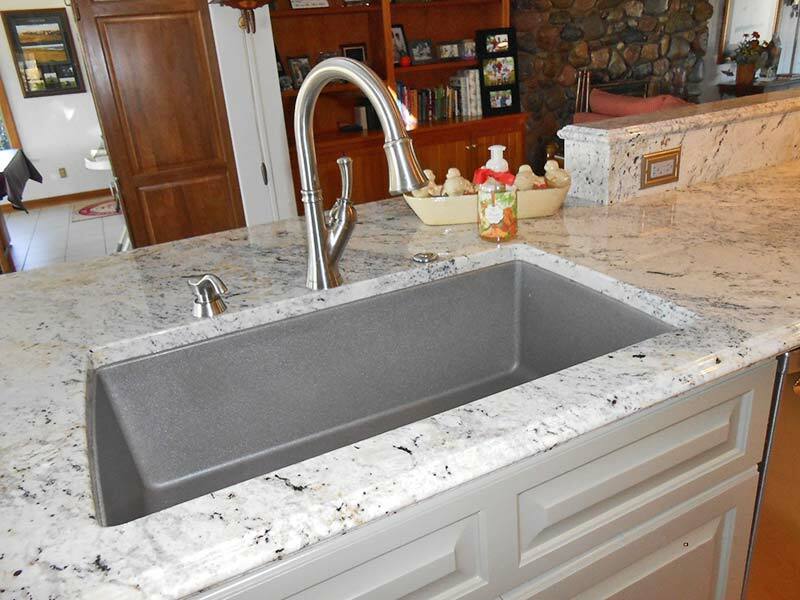 Viscont white Granite kitchen island with stainless steel double sink. 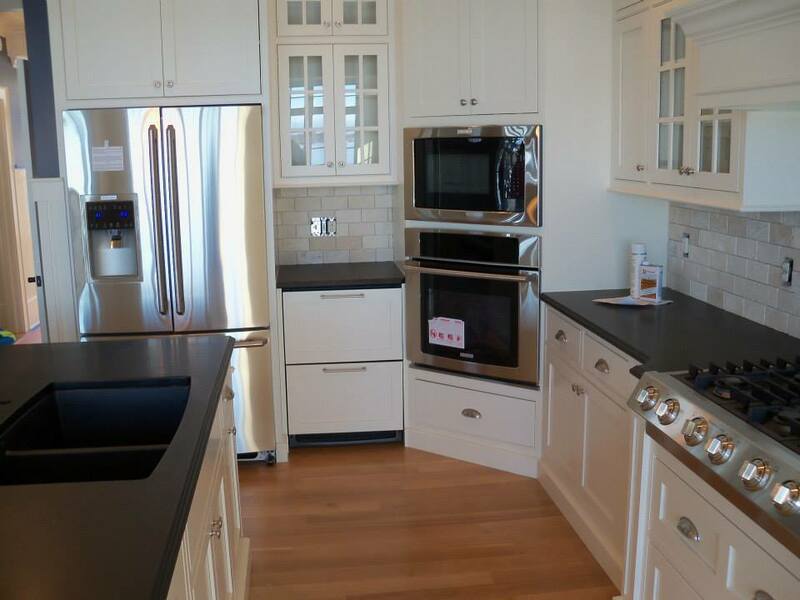 Valle Nevado Granite counters and black cabinets in the kitchen? Yes Please! 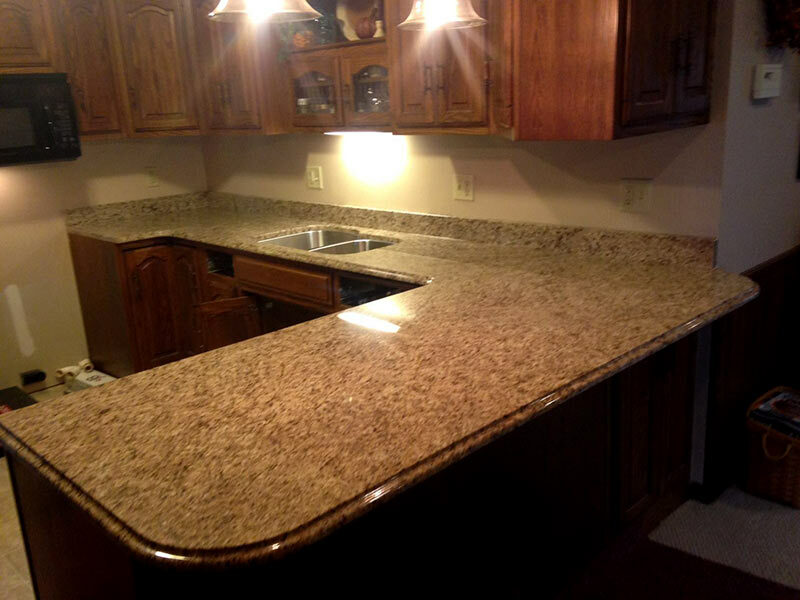 Uba Tuba Granite counters contrast nicely with the golden toned wood cabinets. 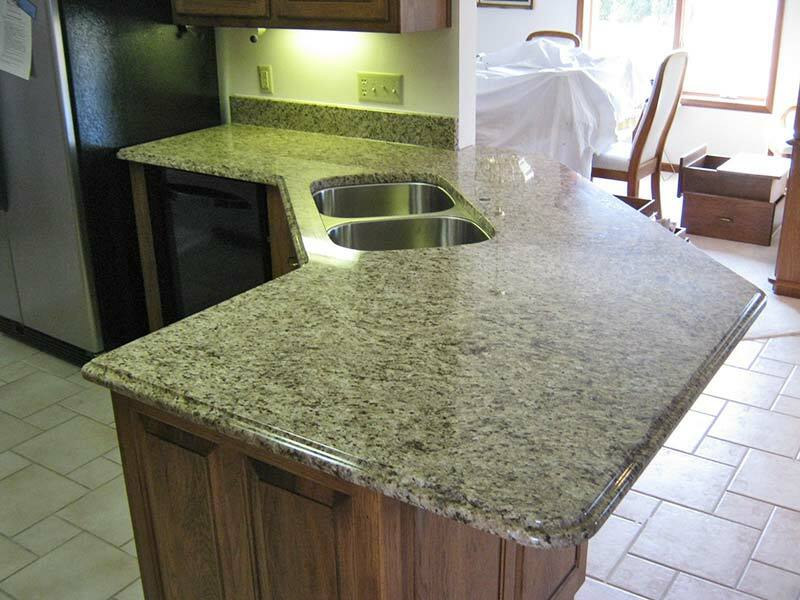 Uba Tuba Granite kitchen counter closeup. 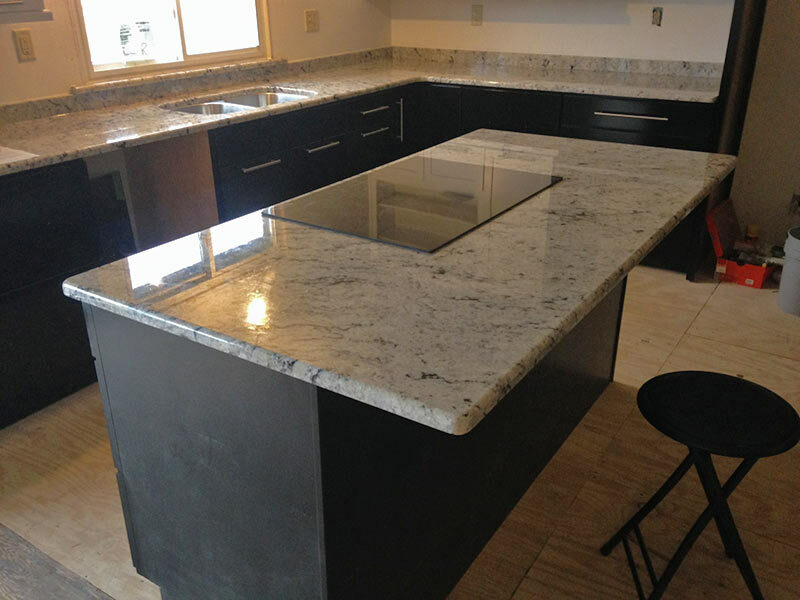 Uba Tuba Granite kitchen counter and island. 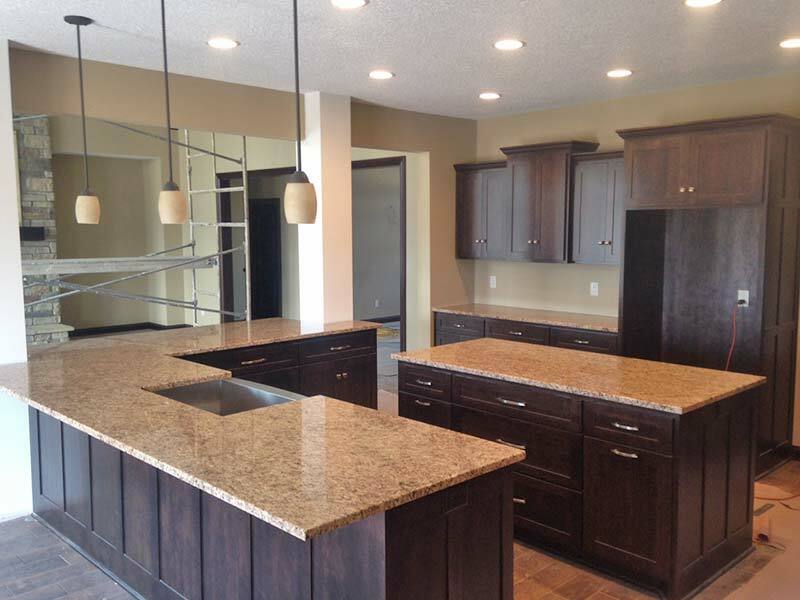 Typhoon Bordeaux Granite kitchen counter paired with dark brown cabinets! 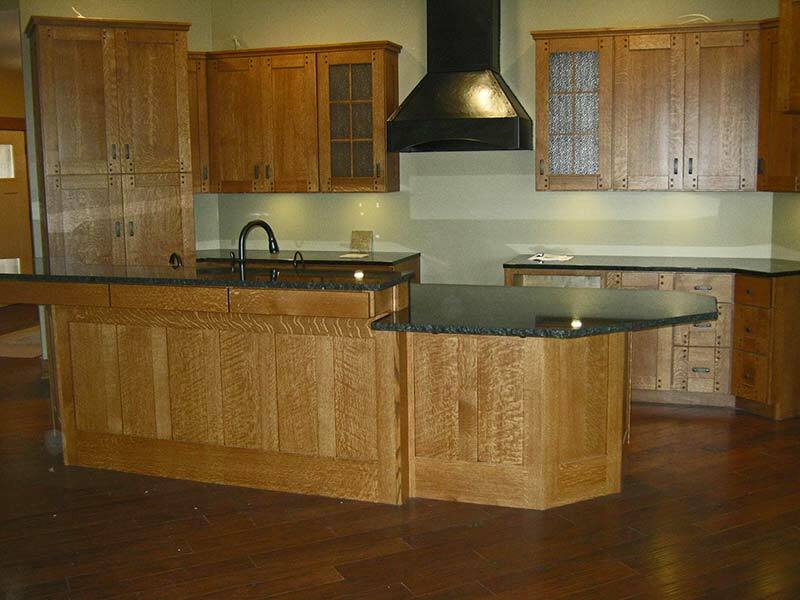 Typhoon Bordeaux Granite kitchen counter and island with warm medium toned cabinets. 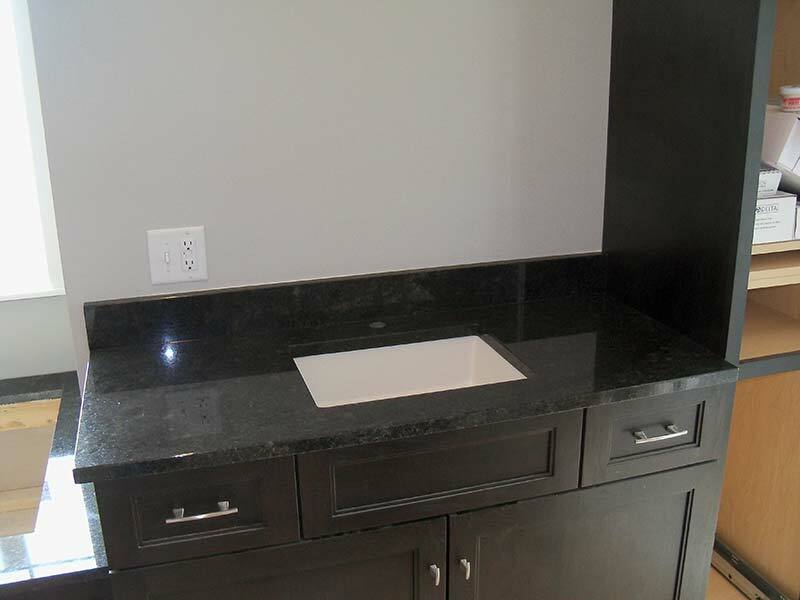 Stormy Night Granite with the custom double sink over ashen retro looking cabinets. 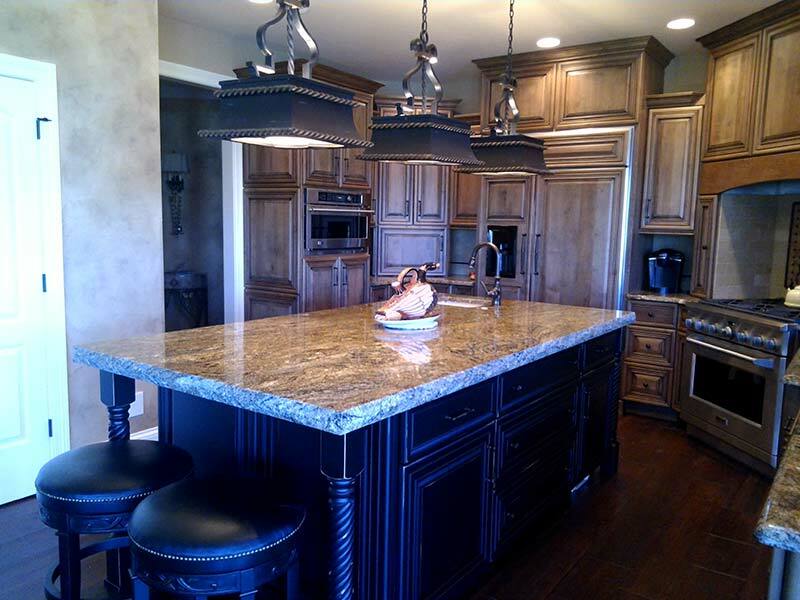 Stormy Night Granite over a dark kitchen island surrounded by medium wood toned cabinets. 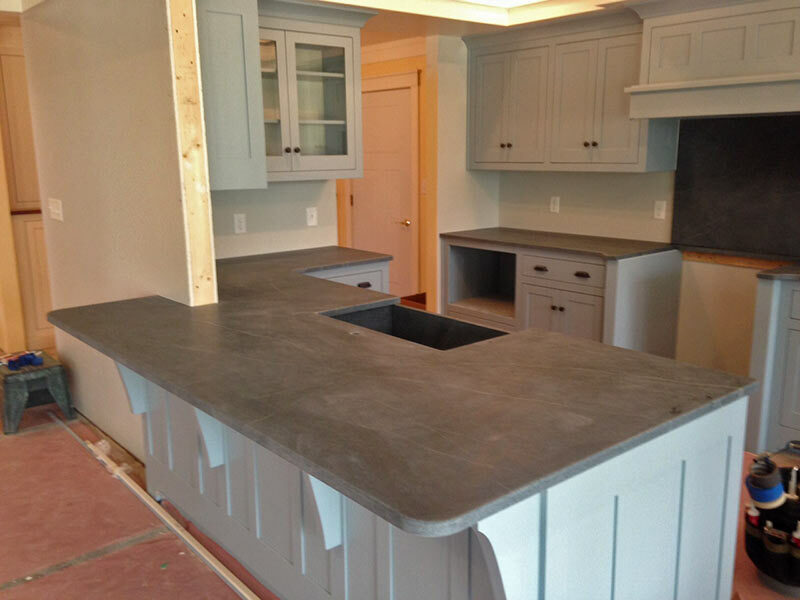 This Stormy Night Granite kitchen island is the focal point of the kitchen. 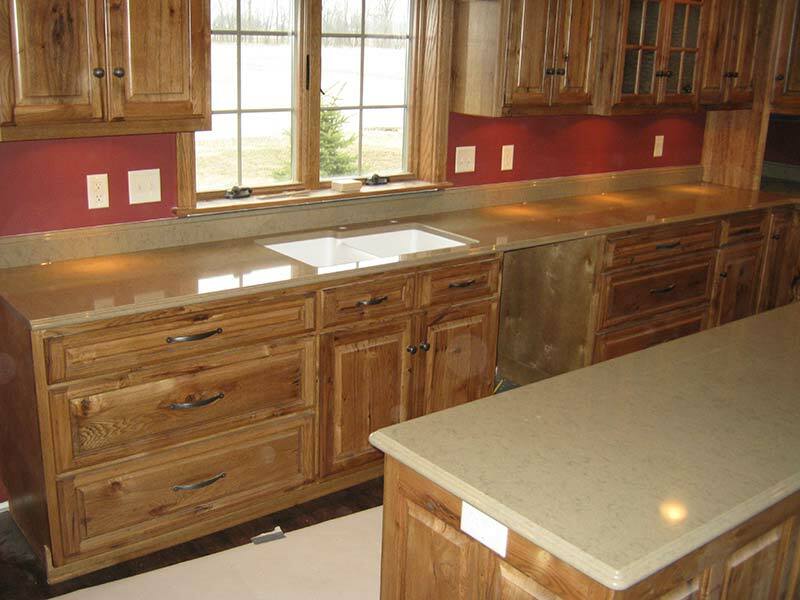 Spring Beige Granite kitchen counter and island with medium warm toned wood cabinets. 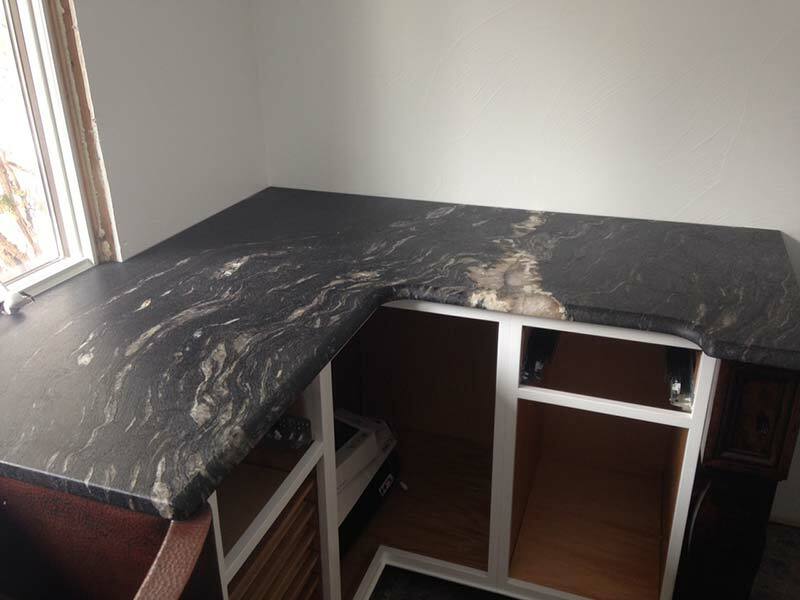 Magma Granite kitchen island playing up the horizontal contrast! 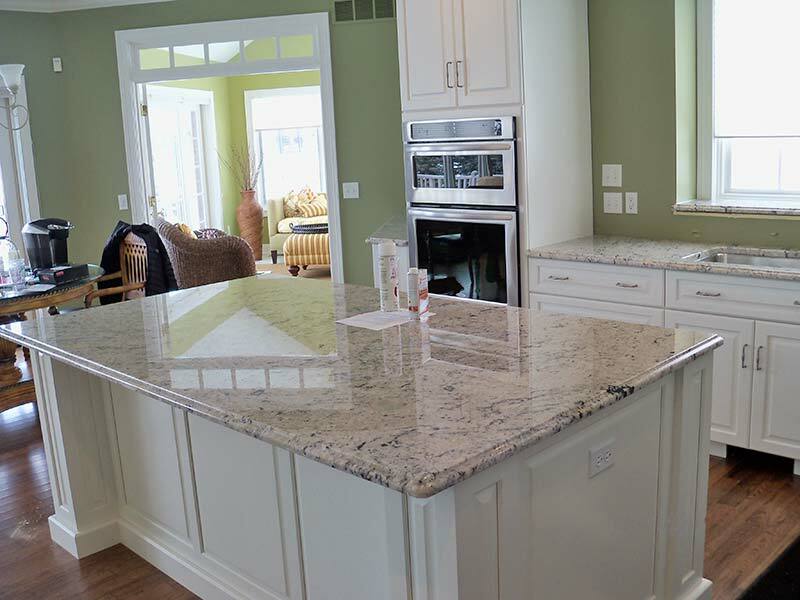 Lennon Granite kitchen island and counters with white cabinets. 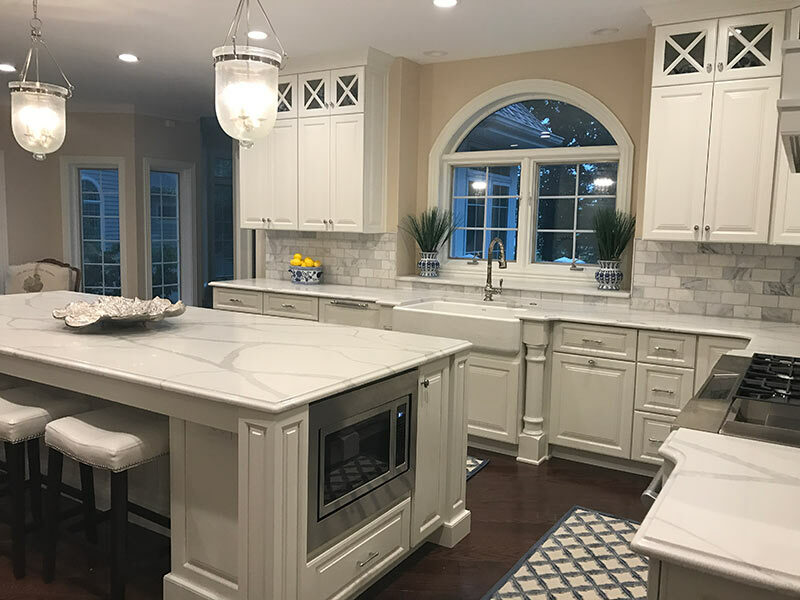 Juperana Persa Granite dark kitchen island is the focal point in this mostly white kitchen. 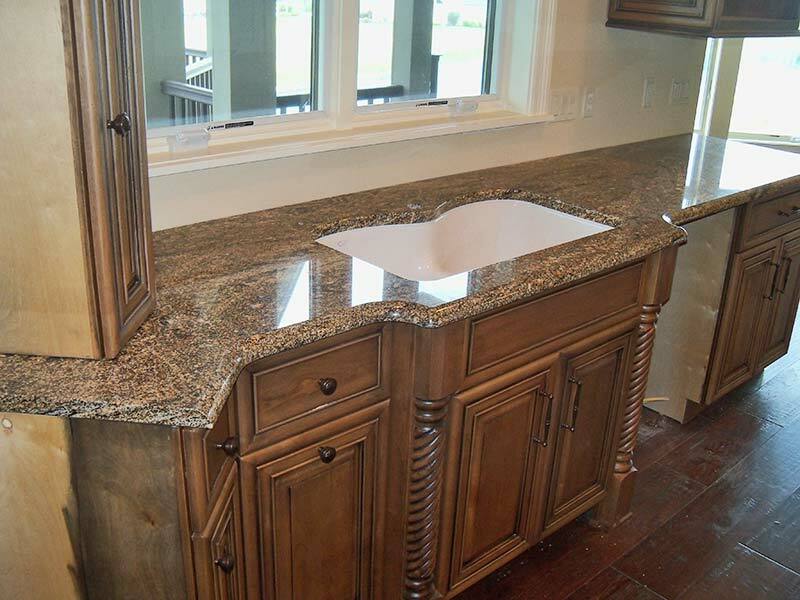 Juperana Gold Granite kitchen island and counters. 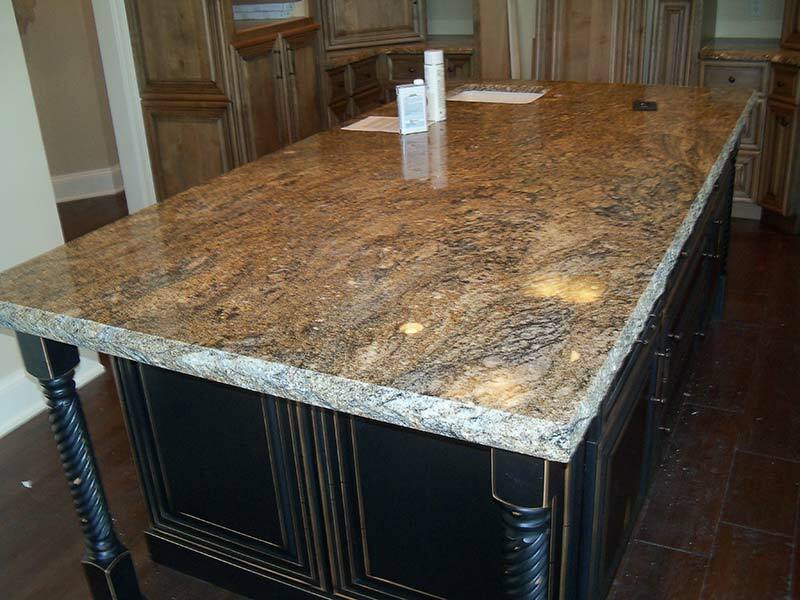 Juperana Gold Granite kitchen island. 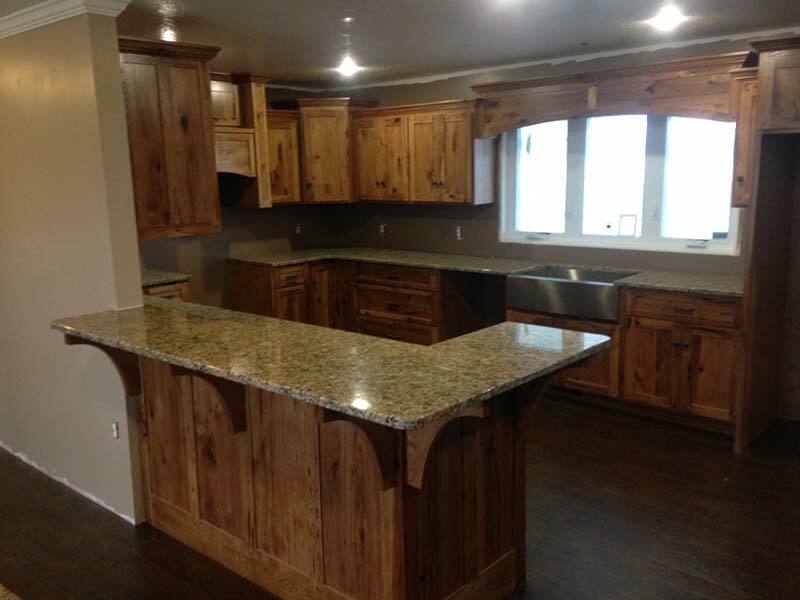 Juperana Gold Granite kitchen island and counters with pine cabinets. 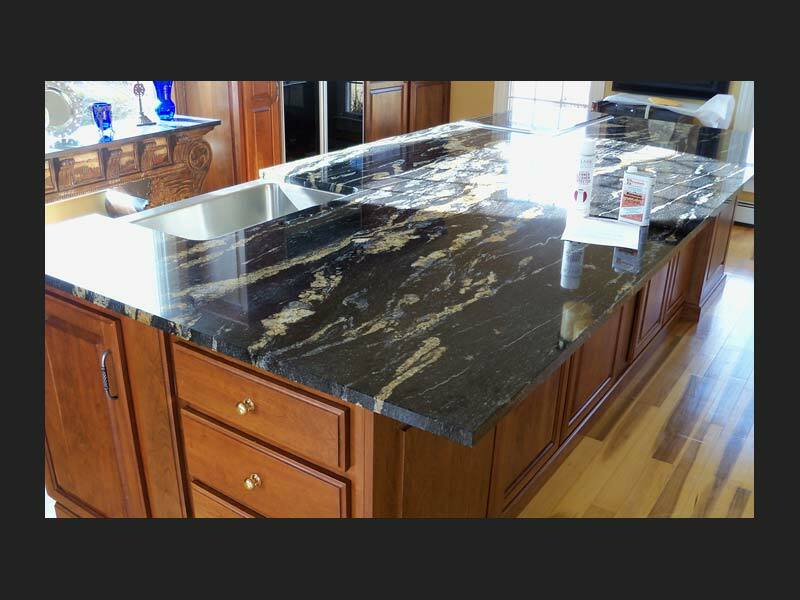 Juperana Gold Granite kitchen island and counters dark cabinets. 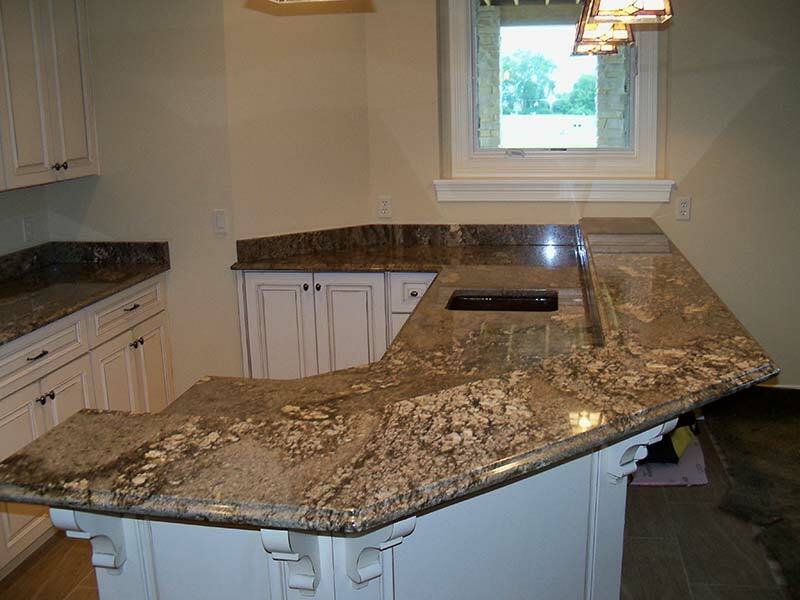 Juperana Gold Granite kitchen counter with white cabinets. 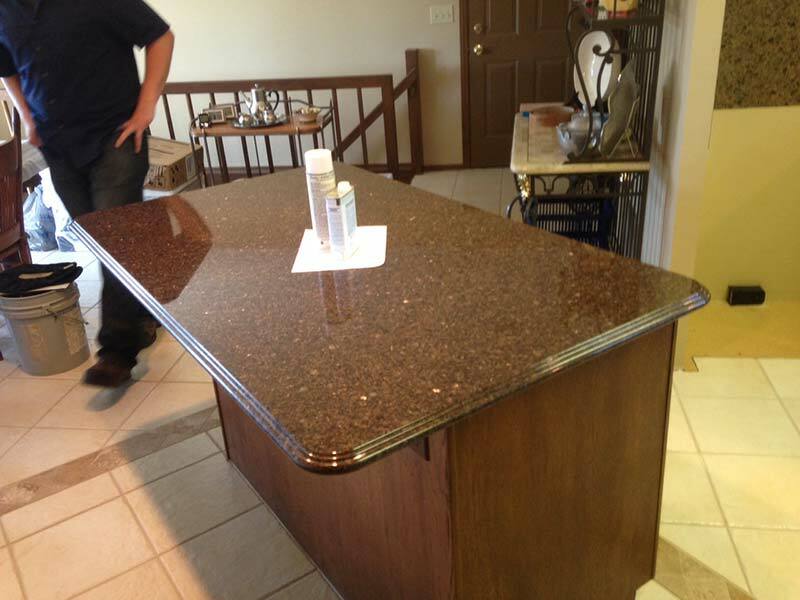 Brown Pearl (Imperial Coffee) Granite kitchen island. 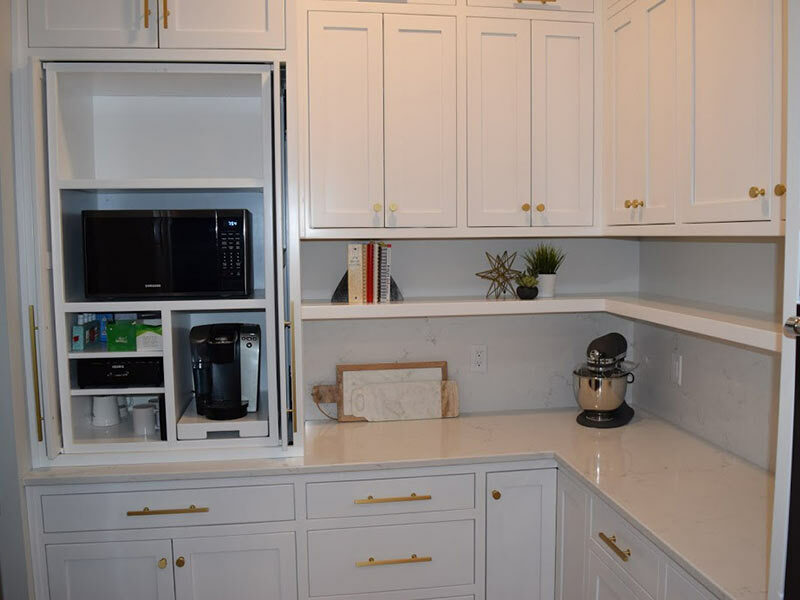 White Marble counters with dark cabinets. 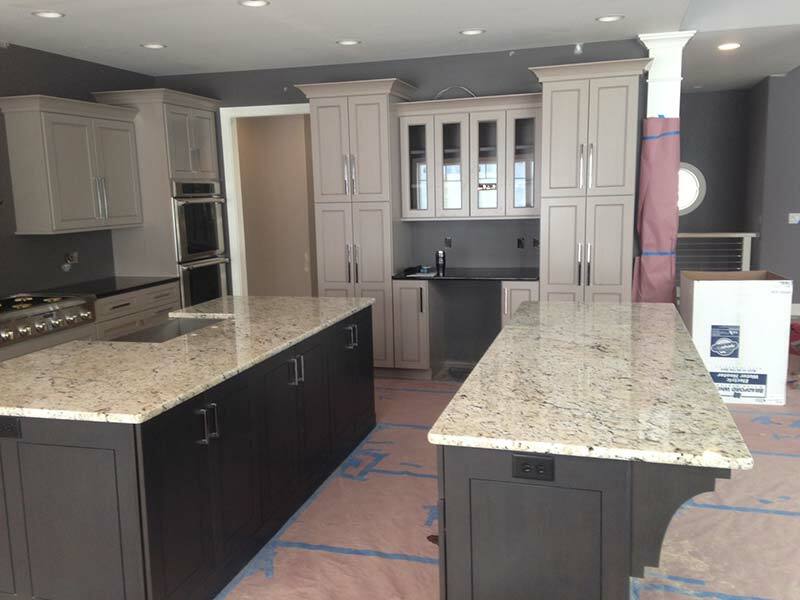 Arctic Cream Granite kitchen counter and island with white cabinets. 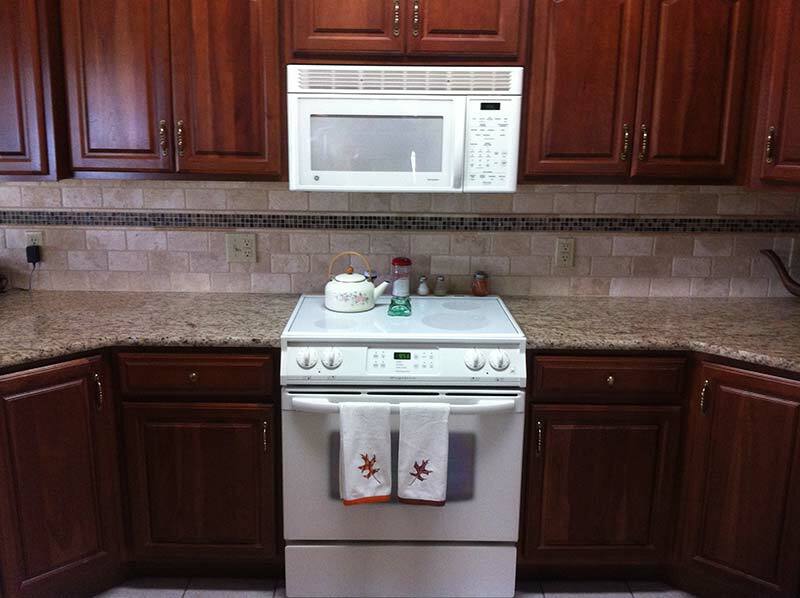 Caledonia kitchen counter with white cabinets. 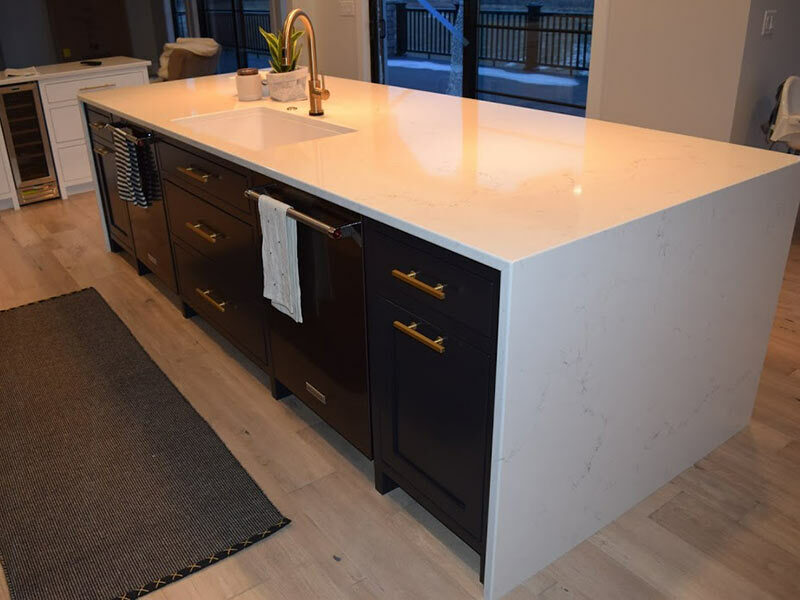 Juperana Gold kitchen island and dark cabinets. 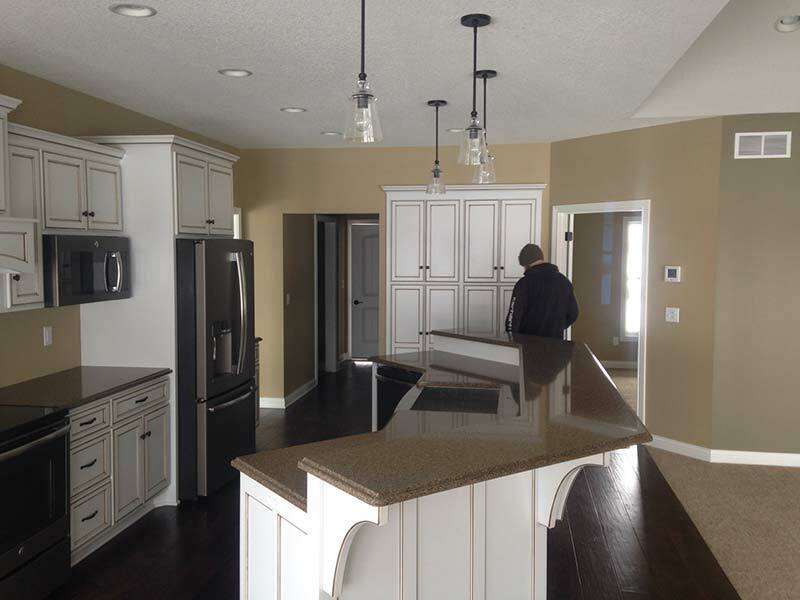 Viscont White Grante counters and kitchen island with brown and white cabinets. 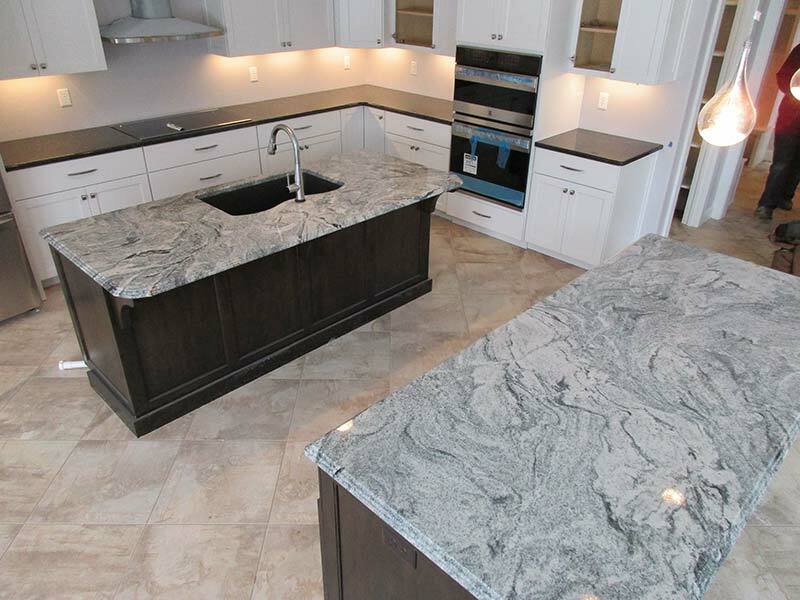 Typhoon Bordeaux Granite looking lovely against medium dark brown cabinets. 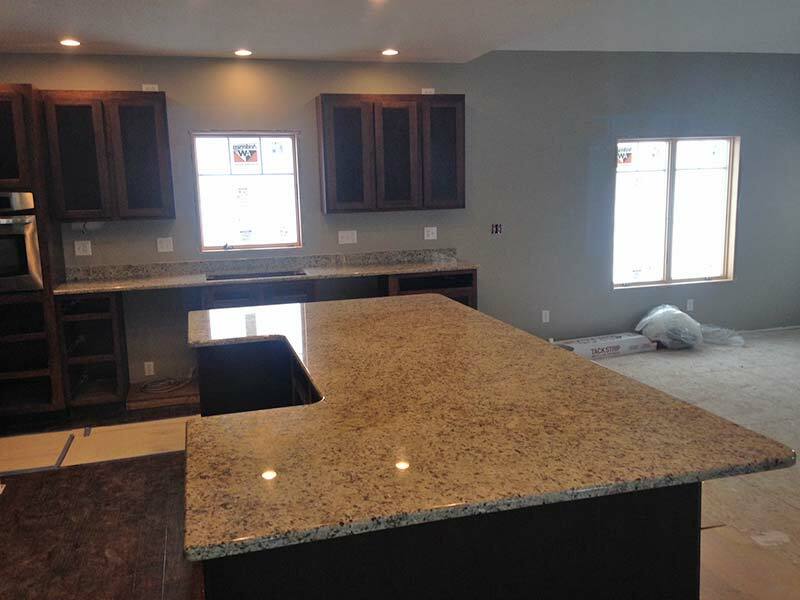 Typhoon Green Granite counter and breakfast bar with white cabinets and stainless steel appliances. 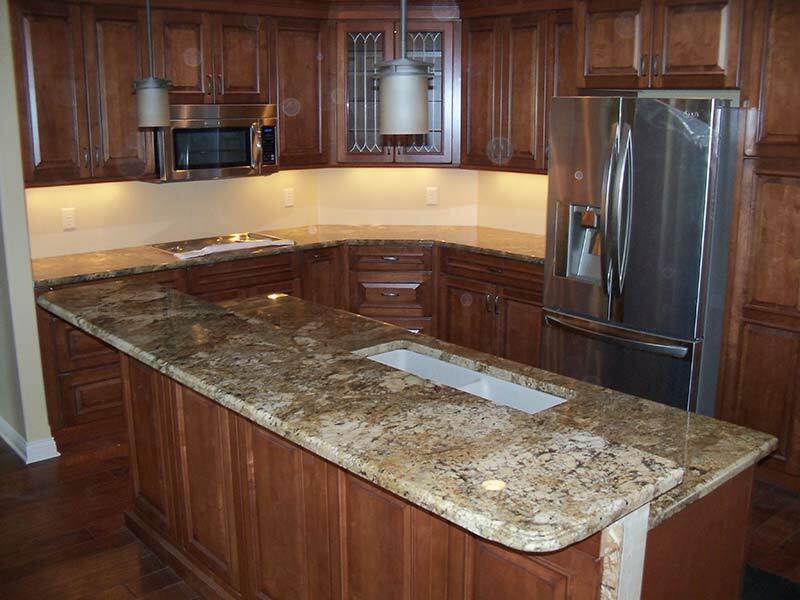 Earthtones create a warm inviting kitchen with Giallo Ornamental Granite and medium brown cabinets. 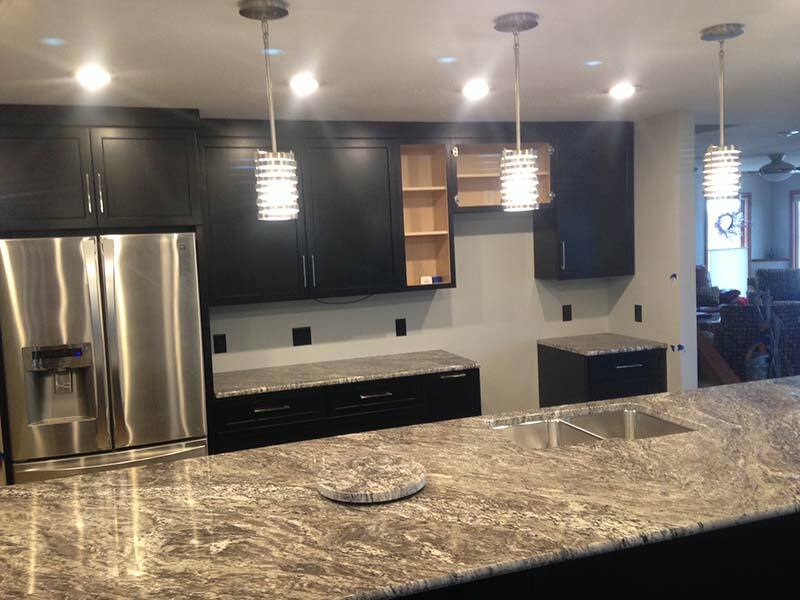 Light Dark contrast is accentuated with White Mountain Granite kitchen island and counters. 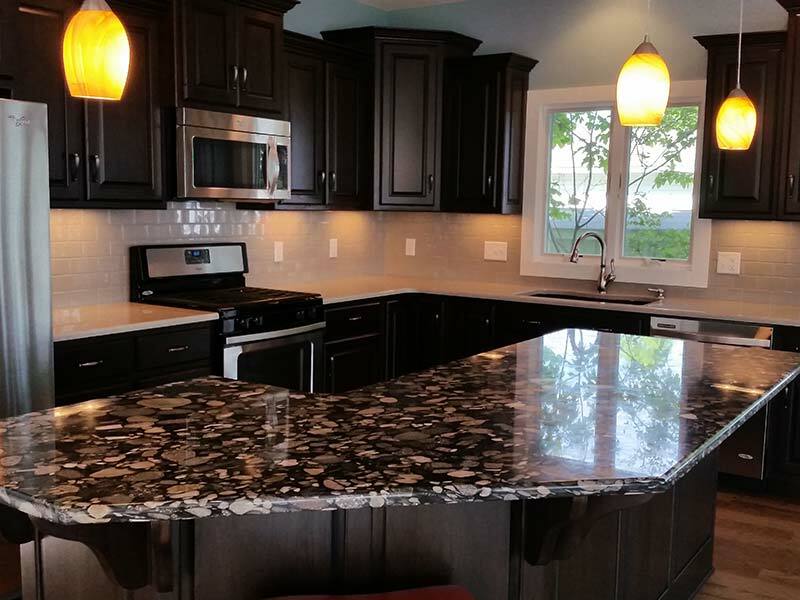 Giallo Ornamental shows off its versatility against white cabinets. 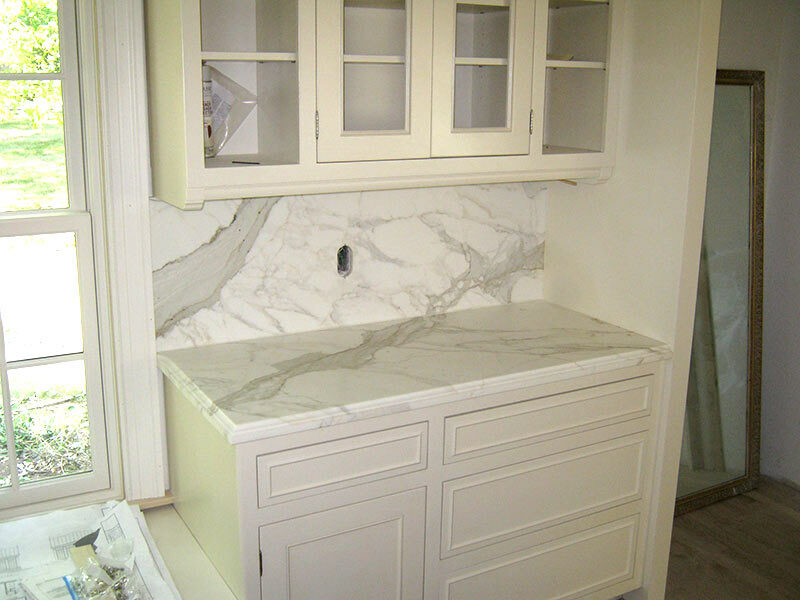 Honed Carrara Marble with white cabinets for that clean look. 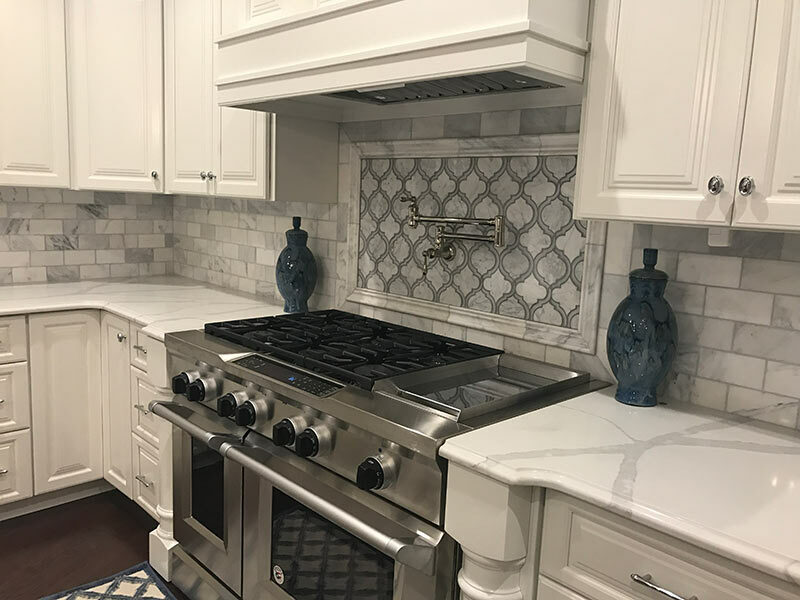 Honed Calacatta Marble kitchen counter and backsplash. 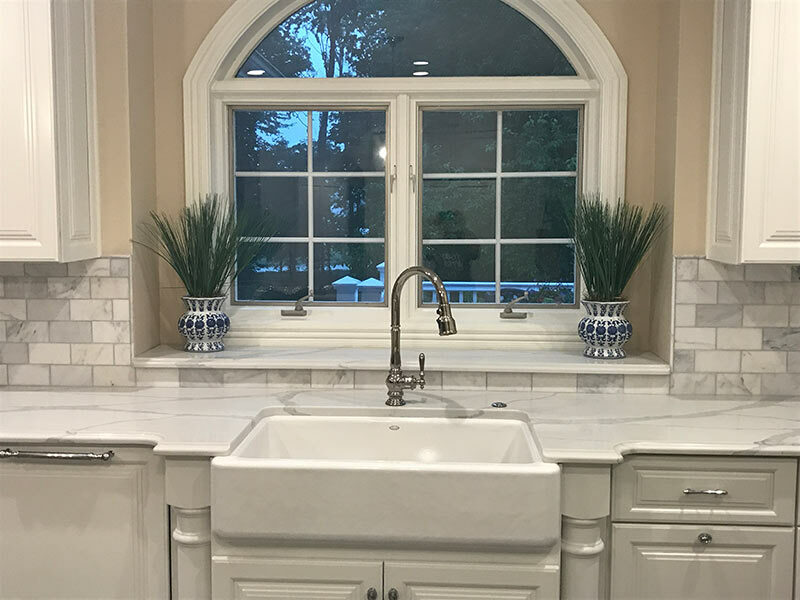 Colonial White Granite kitchen counter with medium brown cabinets. 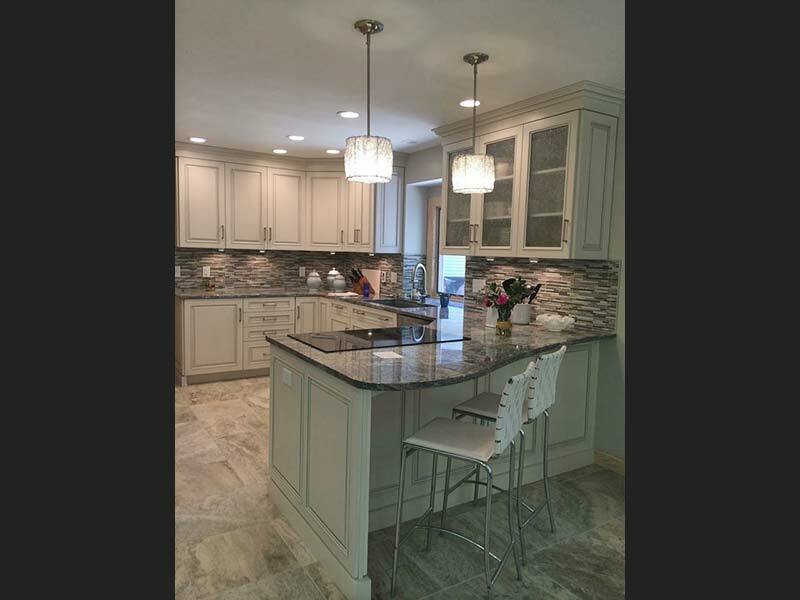 Colonial White Granite kitchen counter and island with Gray cabinets. 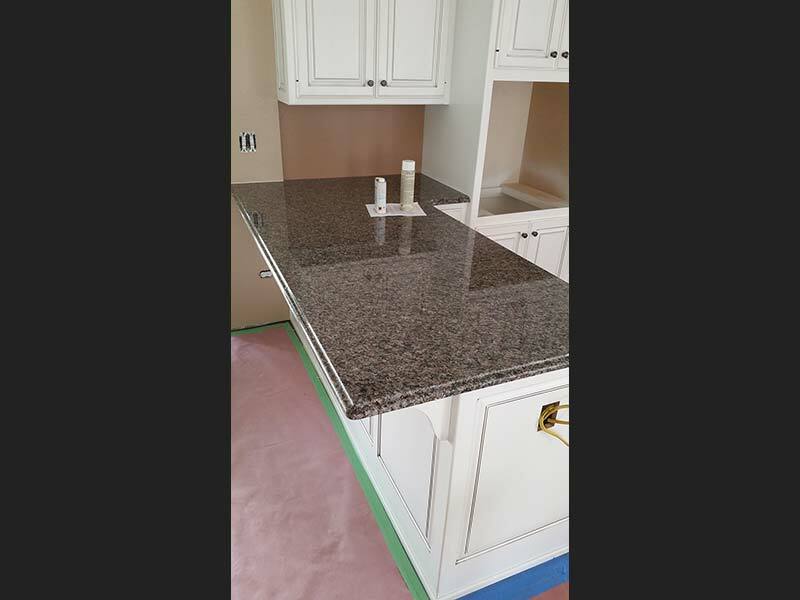 Red Marinace Granite kitchen counters.